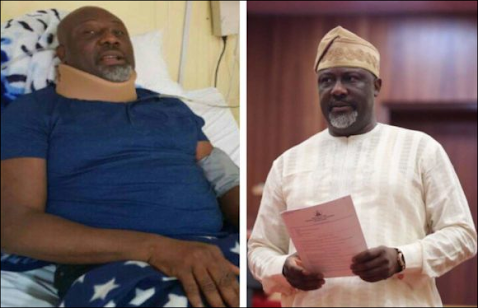 Hope Dino Melaye won't return to the Stretcher? The Attorney-General of the Federation, AGF, Abubakar Malami (SAN) has asked the High Court of the Federal Capital Territory, Maitama, Abuja, to order the resumption of the trial of Senator Dino Melaye. The court had adjourned indefinitely the case to enable the embattled senator to recuperate. The letter dated June 4, and with reference number DPPA/INVEST./023/18, was sent to the court following Melaye’s resumption of legislative duties at the Senate on May 30. The letter addressed to “The Chief Registrar, High Court of FCT, Maitama, Abuja” was entitled, ‘Re; Charge No. CR/106/18: FRN V Senator Dino Melaye; Request for a date for trial’. The AGF office is, in the case, prosecuting Melaye on two counts of deliberately giving false information to the police to frame the Chief of Staff to Governor Yahaya Bello of Kogi State, Mr Edward Onoja David, in an alleged assassination attempt on his (Melaye’s) life. Justice Olasunbo Goodluck had on May 17, 2018, adjourned the case indefinitely, pending when the senator would be discharged from the Intensive Care Unit of the National Hospital in Abuja, where he was then admitted. However, AGF asked the court to commence the trial now that the Kogi lawmaker has resumed his legislative duties. The letter sent to the court read in part, “After listening to both counsel for the prosecution and the defence respectively, the court in its wisdom adjourned the case sine die (indefinitely) to enable the medical condition of the defendant to be restored to enable him to attend court for trial.